But there are other parts of the books that, now I think of it, could well be quite remote for a non-Anglo Saxon person. First of all, knowledge of British humour and culture is helpful in understanding the books. However, the other thing is that the Jeeves books, despite being written up until Wodehouse’s death in the 1970’s, are – quite literally – timeless. The setting appears to be (roughly) Edwardian, so around 1900-1910. There is no mention of the First World War, or of the Great Depression, even though some of the books appear to be set slightly later than 1910. So to get the best out of the books, it helps to have some idea of what life in and around London was like at that time. I think that many of the expressions and ideas generated then are still existent in many of the countries of the British Commonwealth, even if they have moved on in the meantime. But for those from nations with little knowledge of this era or way of life, I imagine that the idea of a lazy man-about-town like Bertie Wooster who can easily waltz off to his relatives’ castles and mansions for the weekend could be a real stretch to understand, let alone empathise with. Then there is the use of English itself….a difficult language to learn. 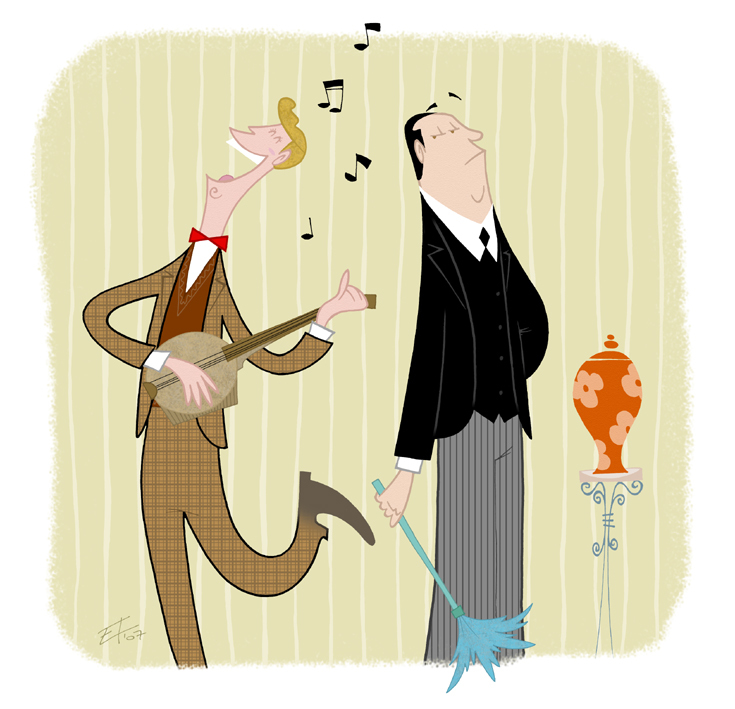 In Wodehouse’s hands, it somehow manages to be gentle, funny and cutting – occasionally, all at the same time! And while I have no doubt that other languages are similarly capable of such beautiful nuance, as a non-native speaker, it may take me years to pick up the true meaning or value of some expressions. And yet, and yet – 40 years after his death, there are P.G Wodehouse societies and links from Russia, The Netherlands, Sweden, Iceland, Italy, Norway, France, Singapore, and India. So there is some ability for this type of humour to cross languages and to be understood. However, my point here is that I would consider Wodehouse to be “deep” culture, in that it can’t easily be spread across the world in a digital fashion, and then for it to “take”, a la many of the Western fairy tales that have been Disneyfied, or what passes for culture on websites like YouTube. I would argue that many lauded cultural products work like this – there are poems and stories by Henry Lawson, an Australian poet, that resonate with me even though they were written over a century ago. But they do not resonate with many urban Australians, for whom the bush is just that big empty space between the cities…and a source of some fear, with its bushfires, snakes and insects. And outside of Australia, or those with some knowledge of the culture, he’s unheard of these days. Full disclosure – I am well aware that my tastes are narrow, especially when it comes to music. In terms of sources, I am similarly narrow…and very much in line with what you’d expect a white Anglo-Saxon male in Australia to read online: the major Australian newspapers, the Economist, a local website for my city (the-riotact.com), crikey.com.au, and various other mainstream websites catering to specific interests of mine. Given my Japanese connection, I read japantoday.com and japantimes.co.jp too. So, I throw out a challenge. Can you share with me some authors or poets of other lands, and other languages (English translations would help, please – even though I know some things get lost in translation), so that I can broaden my world beyond “white people stuff”? I’d also love to hear about why you enjoy it, and how you feel it’s special, or how it reflects your culture. I’d be happy to hear local stories from the United States, too, even though we are divided by a common language! Over here, we only really know (or get to hear about) a lot of the mainstream stuff from the USA…even though it is such a diverse place, and has such a rich history. Aug 11 What place does classic literature have in a multicultural world?